We are just about to start the restoration of our 40ft 1922 British Admiralty built Burmese teak on oak boat. 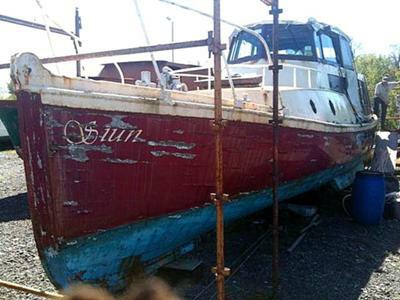 She has been out of the water for about three years and some of the timber has been weathered where paint has flaked off above the water line. We may also soda blast the hull inside and out to see the condition of the hull, replace and repair any sheared ribs, re-caulk where necessary then fair with epoxy and ally prime. Before we ally prime is it beneficial to oil the planking, if so what do we use? We were told that teak loses its oil through evaporation when exposed to air. Also do we ally prime and gloss under the waterline then anti foul or just ally prime then anti foul? We are grateful for the advice and are now considering doing a full re caulk. I am competent at spray painting, is it O.K to spray paint the hull or is roller and brush better? I was thinking of investing in an airless sprayer for this project, it would be useful elsewhere as well. I agree with Ben, don’t bother. In fact I’d go further and say that you are better off with less of the natural teak oil. Too much of the natural oil can cause paint layers to blister and crack as it leaches out. There are oily products such as "Owatrol" that purport to help with paint adhesion, however, if you are using a good quality paint I can’t see why you would want to dilute it. On the other hand I'm all for protecting the wood with a coat of good old fashioned creosote, the only proviso is that it needs to have dried completely before you paint or the paint won’t dry. And yes I would (and did) paint below the waterline with gloss before antifouling, it’s a layer of protection if the antifoul wears off (which is what it is designed to do) before redoing. I would go careful with the soda blasting, I stripped the paint from my boat with a blow torch and scraper, much more fun. While you have the old girl stripped down it might be worth considering doing a complete re-caulk, it’s not the black art that some try to make out. The most difficult part will be raking out the old caulking especially if it is old fashioned putty and red led. She is a grand looking old girl, look after her and she will look after you. Best wishes with her restoration. Easy answer, oil attracts dirt!!!!!! Oil repels ans caused paint to peel. I'd oil bare teak, or teak that I wanted varnished (maybe), but not as a primer coat for paint.